Visit Helsinki Cathedral and Uspenskin Cathedral (Uspenskin Katedraali) for their historical value. 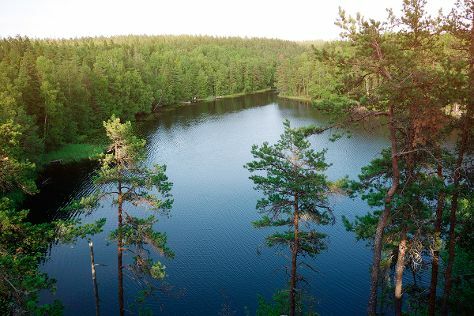 Visiting Nuuksio National Park and Sipoonkorven Kansallispuisto will get you outdoors. Change things up with these side-trips from Helsinki: Teijo national park (in Pernio), Haemeenlinna (Birthplace of Jean Sibelius & Ahvenisto Activity Park) and Valvilla Factory Museum (in Hyvinkaa). There's much more to do: learn about all things military at Sea Fortress Suomenlinna, cruise along King's Road, take in the spiritual surroundings of Kamppi Chapel of Silence, and explore the striking landscape at Hiidenkirnut. To find reviews, maps, where to stay, and other tourist information, use the Helsinki trip builder . If you are flying in from Italy, the closest major airport is Helsinki Vantaa Airport. January in Helsinki sees daily highs of -3°C and lows of -9°C at night. Cap off your sightseeing on the 9th (Sat) early enough to travel back home.